In this article, we’re going to talk a little more about this issue. Even if it seems like nothing’s wrong, your vehicle might be experiencing problems or even not showing the right numbers on the screen. Read on and learn when it is time to make a thorough check on the gauges and parts connected to it, and if you like to know more about gauges, click here. This is a clear indicator you’re experiencing some kind of trouble. It means that something is seriously wrong with your bike. However, it doesn’t necessarily mean your engine is about to die. It just might be the gauge for the oil that is receiving false information. Repairing a broken engine costs a lot of money while the gauges are less expensive. Either way, you need to check that as soon as possible. The gauges shouldn’t make any sound. The only thing you should hear while riding your bike is the motor. If you hear some strange sound coming from them, it’s probably something you need to fix. Sounds like squealing or scratches are a sure sign there’s something wrong going on and needs to be looked by a professional mechanic. 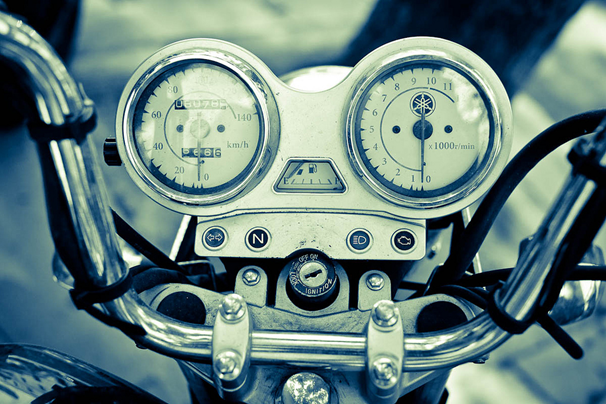 A seriously good motorcycle has gauged whose needles showing the results are moving calmly. Speedometers always show the exact speed and if the needle in the gauge is going up and down or moves in a trembling way like its dancing than you probably have a problem in the cables that are connecting the apparatus. This is not a big deal, but you surely need to make some repairs which won’t cost you too much. When it comes to speedometer problems, what you need to know is at the link. This is an easy one, right? If the needle is not moving and your wheels do, then the cables connecting the speedometers are broken or damaged. You need to see a mechanic right away because this is a very serious issue. You can’t drive around without knowing how fast you’re going. There are situations, especially in the fuel gauge when certain situations cause the needle to move and behave in an unexpected way. For example, when you turn the gas and accelerate the needle suddenly shows you have less gas than you actually have. Then, after a second it goes back to its original position. This means the gauge is getting incorrect information and something is causing this malfunction. You need to make a repair so you can always know how much gas you have. Sometimes the speedometer can show different numbers than the real ones. This is very dangerous and also you might get a ticket from the police for speeding. If you drive pretty slowly, but the speedometer shows that you’re going 30, then you can be sure that something is not right with gauge. A little touch from a professional and you’ll get the job done. It’s an easy repair when it comes to gauges and parts that go with them. You have to do them as soon as possible because they might not be life-threatening in all situations, but they will surely cause you greater problems later. Gauges are simple vehicle parts but like everything else on it, needs constant maintenance.